Each month Digital Signage Connection asks their members of the DSE Advisory Board a question of the month. This month, the question focuses on how to engage in a busy environment. Here is a response from ClockNine’s Chief Creative Officer, Travis Kragh. 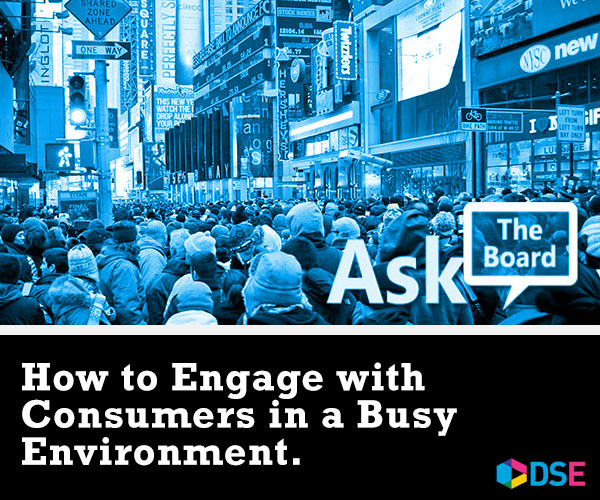 What is the best way to engage consumers in a busy environment? Engaging customers in a busy environment can be a challenging task. Consumers tend to be preoccupied, overstimulated and easily distracted. As advertisers, we are constantly fighting to get just a second of attention. That’s why it’s vital we communicate quickly and efficiently when we get the chance. At ClockNine, we utilize human vision science to help maximize our engagement with viewers. Understanding more about your environment and how the human brain processes information can help you maximize your opportunities to engage. Our eyes are only able to fixate on one thing at a time. During a single eye fixation, our brain only processes an area roughly the width of our thumb. Digital signage designs need to take into account visual proximity. Keep information tightly grouped together so consumers can easily get all information. When the brain decides where to look in a busy environment, it breaks it down into five key elements: color, contrast, shape/edges, faces and motion. Use these elements with purpose to gain your customers’ attention. It’s important to determine how much time you have to make a connection with the consumer. This is referred to as “dwell time” or CVD (consumer visit duration). Likely, it’s only a few seconds. Your messaging should be short, concise and on the screen long enough for viewers to digest. Rather than being held captive on the couch, your audience is on the move. Catch the individual’s attention and get the message across before another distraction sets in.